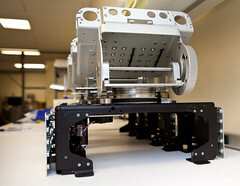 The engineering and production team is making significant progress on the production of Beta PR2 robots. 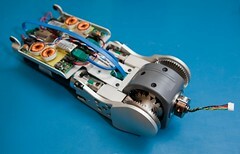 After completing the grippers, attention has been focused on the various other assemblies. 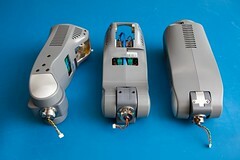 Most of the other assemblies -- head, laser sled, forearm, upper arm, shoulder, caster, spine, base, and turret -- are in process, with one head already in testing, and additional heads in burn-in. 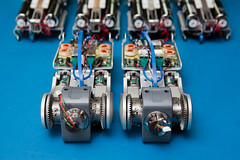 There are already twenty-four full casters in production, which is enough for six PR2 robots. Most of these casters have already undergone qualification tests, with six units also run through our rigorous burn-in process. After all of the casters are complete, they will be set aside and later mated with the base and spine. Of the over six thousand parts needed to build each PR2, we are only waiting on the final twenty-four. Our stockroom is filled nearly to capacity, and as we continue to combine one sub-assembly with another, the PR2 robot is beginning to take shape. PR2s Headed to Korea, France, Seattle and Washington, DC.